Wow, what a wild [card] weekend! Great football games. 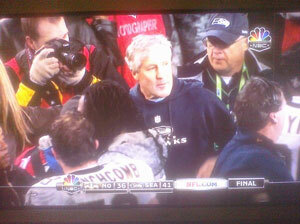 I was heavily rooting for Seattle over New Orleans, and how great was it that they won? I love it when the worse team plays better and ends up winning. The Saints are a great football team, while the Seahawks are merely good, but yesterday they rose to the occasion. (In fact, as the first 7-9 division winner you could argue they aren't even "merely good".) I am a Pete Carroll fan - yeah, I know about the USC recruiting violations, but hey the USC teams were great because of Pete, not because of recruiting - and it is nice to see him have success in the NFL. The enthusiasm and energy of the Seahawks was palpable; they actually thought they could win. And they did... Next weekend they play the Bears, and I'm telling you they could win that game. You know they will think so too! Next up was a thriller of a different kind, a game that went down to the wire, with dueling last minute drives and field goals; first Manning set up Vinateri to put the Colts ahead (ho hum, what's new), but then Sanchez set up Folk for the win (awesome!) I was rooting for the Jets, they were the worse team which played better, and while I respect Manning I've never been a big Colts fan. 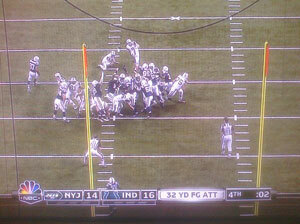 And you have to like Mark Sanchez, and Rex Ryan... next up for them are the Patriots, good luck! Today's first game was a laugher; the Ravens steamrolled the Chiefs. The better team played better, and that's what happens. I had no rooting interest and skipped through most of the game. The Baltimore defense looked pretty tough, I imagine they're going to give Pittsburgh a tough time next week in what should be a great game. And then tonight's game was another wild one capping the wild weekend, as Green Bay prevailed over Philadelphia. When in doubt I always root for Green Bay; I love it that a town of 100,000 people sustains an NFL team. It was an interesting game, with a lot of back and forth; I hesitate to say the better team played better, I'd say the teams were evenly matched, if different, and in the end the consistency of Aaron Rodgers and the Packers outlasted the brilliance of Michael Vick and the Eagles. I'd give Green Bay an even chance against the Falcons next weekend. It was a wild weekend featuring a lot of nothing; too cold to ride, so I contented myself with working on the elliptical while watching football. Onward!